The day is milder and far less windy than yesterday: it is Saturday and rowers are out in numbers. 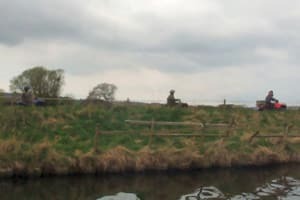 Once along the west bank came a parade of quad bikes and on the water several more narrow boats approached too, each helmsman proffering a hearty wave. Calm water made for interesting reflections and patterns behind the stern. There was just one lock to pass through today, the paired Dutton Locks. 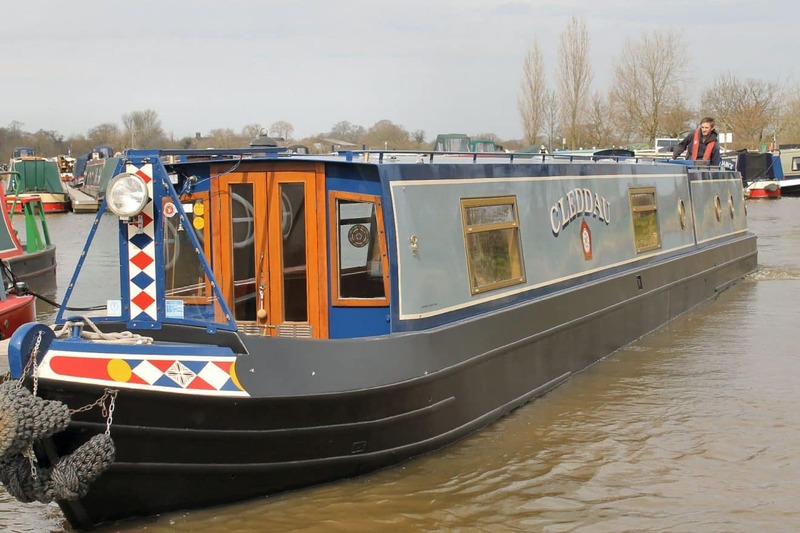 As Cleddau passed Pickering’s Wharf the Captain phoned ahead to warn of our approach.”We’re happy to wait if it’s your lunch-time,” suggested the Captain. Cleddau was waved into the larger chamber by the lock keeper. As ropes were being attached to bollards above a text from Techno Son-in-Law pinged in on the Captain’s phone, (the Cheshire Three are currently travelling in Scotland). We’re at the Fort Augustus flight of locks on the Caledonian Canal, it read. The Captain, compelled to reply, texted back: And we’re going up in a 213 foot long lock – and we feel terribly small! The lock filled (slowly, “it’ll take fifteen minutes”, was the assurance) and then the gates opened. Outside, coming downstream, was not one, not two, but four narrow boats all waiting to enter the lock. And the lock seemed plenty big enough to take them all together. On Cleddau cruised, just for about another mile, the mooring destination for Saturday night being Acton Bridge, and the Leigh Arms a place for dinner. Grateful thanks today to Relief Captain for being at the helm throughout the morning and to Relief First Mate for duties carried out at the galley sink, with a sweeping brush and with the bow ropes.